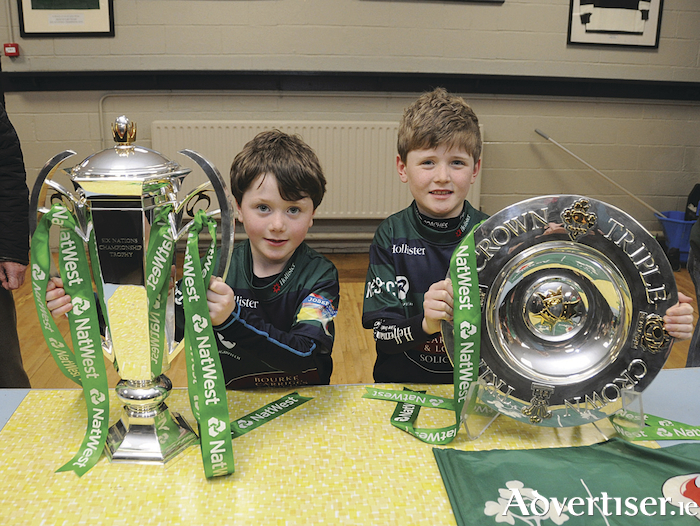 Peter and David Baynes from in Ballina Rugby Club with the Six Nations and Triple Crown trophies. Photo: John O'Grady. Mayo based Senator Michelle Muhlerin has requested that the Joint Oireachtas Committee on Ariculture, Food and the Marine hold a special meeting along with Teagasc to help find a solution to the problem. Senator Mulherin said: “The Minister has taken a number of steps to try to ease the situation for farmers and it is important that we have a full discussion to establish the extent of the problem and the effectiveness of measures to address same. This is a critical issue for many farmers at the moment and is set to get worse if the bad weather continues. “I also request that the Minister for Agriculture, Food and the Marine [Michael Creed], Teagasc, and the major co-ops of the regions be invited to the committee. Yesterday the Minister announced financial assistance for the importation of fodder to be done through the major co-ops. "I have also spoken with Aaron Forde, the managing director of Aurivo, which primarily services Mayo, the west, and northwest. He assures me that Aurivo are in a position to help farmers get fodder and any farmer with a need or anticipating a need shortly should make contact with their local co-op store. The issue was also raised at the Claremorris Municipal District April meeting this week. Cllr Patsy O'Brien told the meeting: "Nobody has to do a survey to see the grass is not growing, again we are having plummeting temperatures this week — there is no grass and there was a survey done this week where 30 per cent of farmers have only enough of fodder for one week. "There isn't a person involved in the industry who will be free of this," Cllr O'Brien added. "We always had fodder to feed the cattle until May, but we did not have to house cattle since August, like they did last year, in normal circumstances. "I was speaking to one particular man who told me he put in his cows on August 24 last year and he envisioned them having to be in for nine months in total, it is unsustainable. "The quick fix would be getting some meal concentrate of some sort to them — everybody knows this is a crisis, all I am saying is they should roll out concentrate to farmers. It is unfortunate that people had to sell cattle because they could not feed them and that is what has happened." Cllr Damien Ryan supported Cllr O'Brien, saying: "To be honest it is a crisis and it is of huge magnitude, it started by people having to house cattle eight or nine weeks earlier than they would have normally had to, and they have now to keep them in longer and there looks to be no end to this in sight. "We need the Minister for Agriculture to roll out a the meal voucher scheme, and I know he has a transport subsidy earlier this year, but the simplest way to have an effective scheme is to have a meal subsidy scheme. No matter how quickly the weather picks up, there will not be grass for at least three or four weeks after it does."